Late-night host Jimmy Fallon came forth this Tuesday to blast President Trump over the recent dismissal of Secretary of State Rex Tillerson. 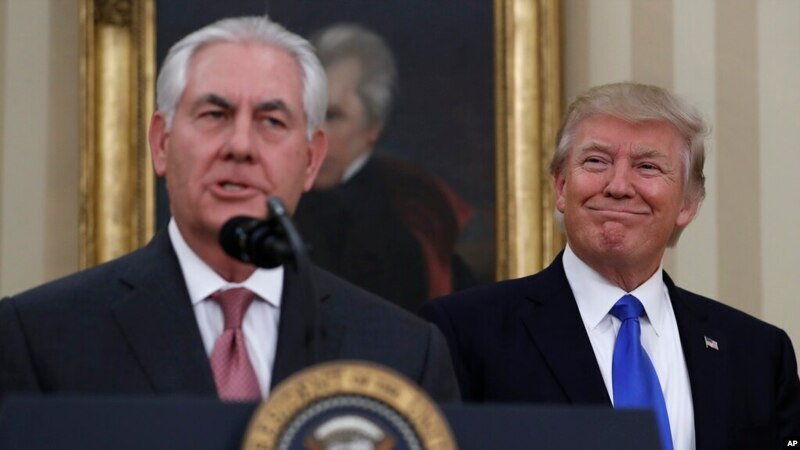 “In the past few weeks, Gary Cohn, Hope Hicks and now Rex Tillerson have all left the White House. Most people have said they’re shocked, while Betsy DeVos was like, ‘Wait, how the hell am I still here? Didn’t anyone see ’60 Minutes’? Pretty popular program,” he said, citing to the education secretary’s latest interview in which she struggled to answer basic questions regarding policy. The president announced in a tweet this Thursday that he dismissed Tillerson, and replaced him with CIA Director Mike Pompeo. Trump explained to reporters Tuesday morning that he made the decision “by myself,” seemingly suggesting he had not talked with Tillerson before firing him. “I actually got along great with Rex, but really, it was a different mindset,” the president added. Fallon’s late-night star Jimmy Kimmel also nailed Trump over Tillerson’s firing, making a joke referring to first lady Melania Trump. “I’m starting to think he fires people just so he can get some going-away cake at the party. Trump told reporters he made this decision ‘by myself.’ Like a 5-year-old. ‘I did it all by myself.’ Of course you did by yourself, there’s no one left at the White House anymore. It’s just you and your Slovenian captive,” Kimmel said to gasps and applause. “Was that too much? I’ll make a note of that,” he added.